Rock with Crinoid Fossils From Twiston, Lancashire. OS grid reference: SD 8090 4444. Something of a curiosity this one, maybe. 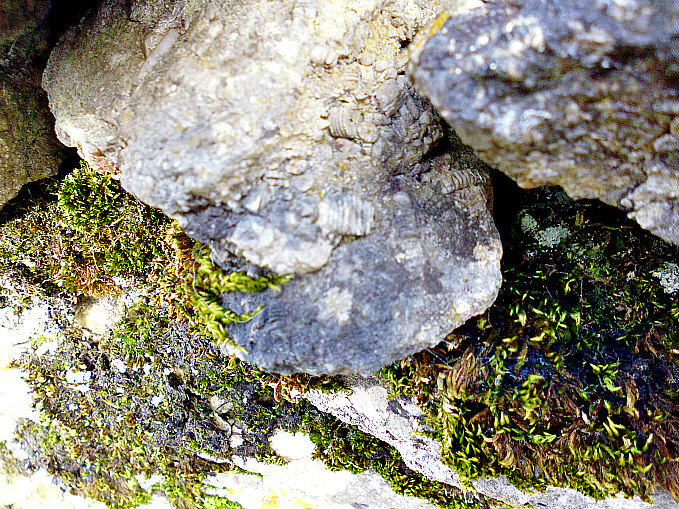 In the wall along a stretch of the lane that runs through the long, narrow valley between Twiston and Downham, at the north-western side of Pendle Hill, in Lancashire, are lumps of locally quarried ‘Fossiliferous Limestone’ made up of crinoid and coral fossils, which date back some 500-300 million years to the Carboniferous period in Geological history. But what a delight it is to just wander along the lane looking at the fossil-covered stones that make up the walls, and there are literally thousands and thousands of them to be seen here. These crinoid fossils are very varied in shape and form, but they are in essence tiny marine creatures which originated from the sea – so we know without doubt that this area was under water millions of years ago, with perhaps only the top of Pendle Hill visible at that time. 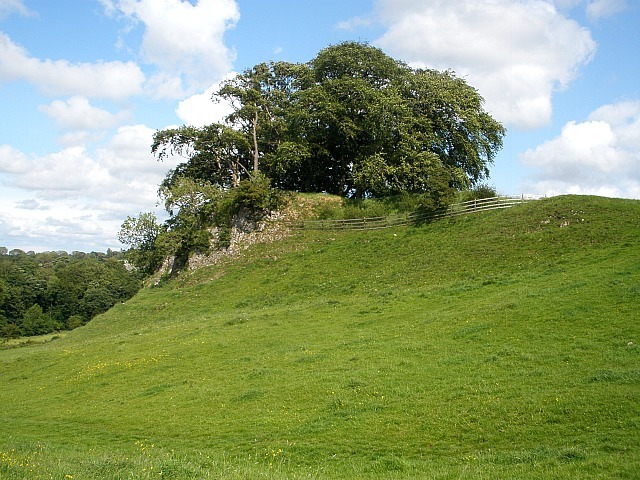 The stones that make up the walls in Twiston may have been quarried from the Limestone ‘reef knolls’ – of which there are several in the Twiston and Downham area, or perhaps from Peach Quarry at Clitheroe (Os grid ref: SD 7569 4263). This quarry has now been filled in and grassed over. These ‘reef knolls’, as the name suggests, were also under-water millions of years ago. There are ‘still’ three 19th century lime kilns in the Downham area; one of these stands beside the lane at Twiston, all of which points to the fact that Lime, in the form of a powder or “cornbrash”, was a much used local neccessity on farmers’ fields in the Pendle area, and is still used by local farmers today. Rock with Crinoid Fossils, Twiston. 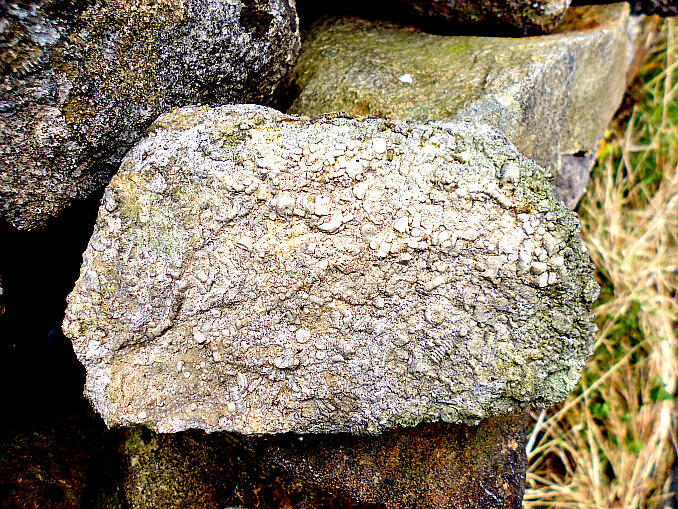 A significant feature of the valley landscape between Twiston and Clitheroe is the abundance of Crinoid Fossils in the stones making up the walls of field boundaries. 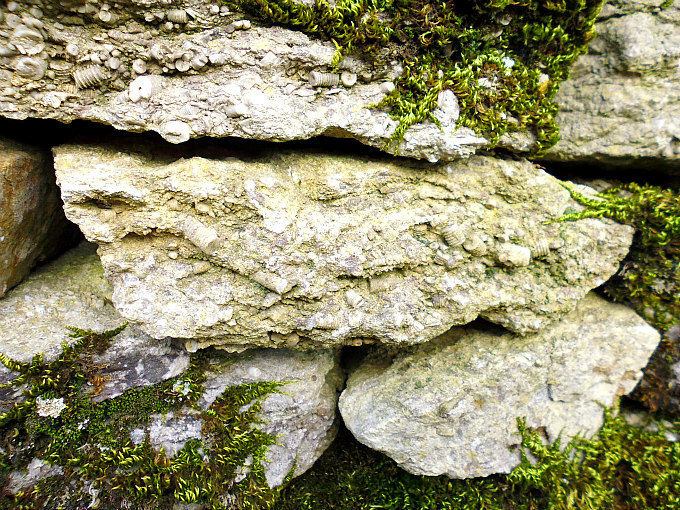 This type of stone is called ‘Reef Limestone’. Crinoids are sometimes referred to as ‘sea lilies’ because of their resemblance to a plant or flower. In parts of England, the columns forming the stem were called ‘fairy money’, and their star-shaped cross sections was associated with the sun by ancient peoples, and given religious significance; indeed ancient people were said to be frightened by these strange fossil forms, as they did not know or realize what they were, and where they had originated. Crinoids are infact marine animals belonging to the phylum Ecinodermata and the class Crinoidea. An array of branch-ing arms (brachials) is arranged around the top of a globe-shaped, cup-like structure (calyx) containing the mouth and main body of the animal. In many fossil forms the calyx was attached to a flexible stem that was anchored to the seabed. The phylum Echinodermata includes the starfish, sea urchins and sand dollars. The crinoids are a breed apart however, as they resemble an underwater flower. Some even have parts that look and act like roots anchoring them to the ocean floor. They are commonly called ‘sea lilies’. Their graceful stalks can be meters long. Other varieties have no stalks or root- like parts. They are commonly known as feather stars. Unlike the sea lilies the feather stars can move about on tiny hook- like structures called cirri. 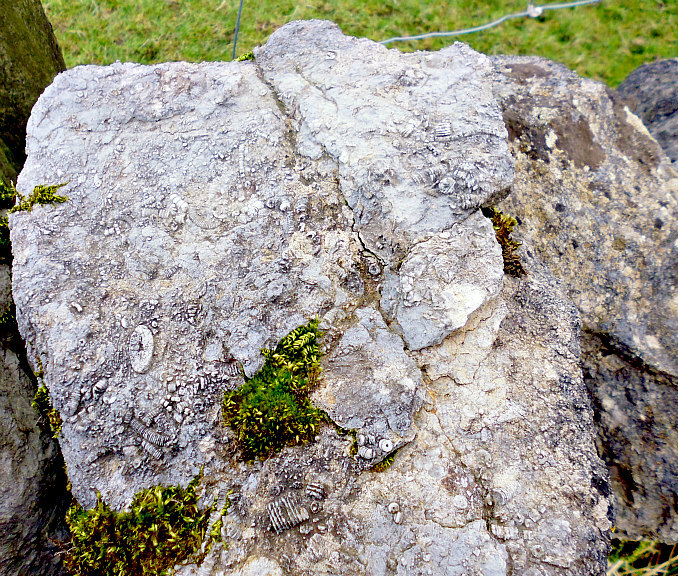 Rocks with fossils at Twiston, Lancashire. Crinoids are still with us, but they are also some of the oldest fossils on the planet. They flourished in the Palaeozoic Era 541-254 million years ago. Although sometimes different in appearance from their fossil ancestors, living forms provide information about how fossil crinoids must have lived. The earliest come from the Ordovician the second period in the Palaeozoic. At least the earliest that everyone agrees on. There is a class called Echmatocrinus that date back to the middle of the Cambrian Period the first period in the Palaeozoic, but most palaeontologists don’t count them to be true Crinoids. Most of the Palaeozoic forms died out in the Permian the final period in the Palaeozoic Era. The few species that survived into the Mesozoic Era thrived. Many new species evolved during this time including the ancestors of the present-day class Articulata. Rock with Crinoid fossils at Twiston. These echinoderms created ‘forests’ on the floor of the shallow seas of the Palaeozoic and Mesozoic Era’s. There were so many in places, that thick limestone beds (reefs) were formed almost entirely from their body parts piled on top of each other. Crinoids fossilized readily and so there is an abundance of them to be found, mostly stalk fragments as in the photos. There are two reasons for this – the ocean floor is a good environment for fossilization to occur and Crinoid skeletons are made of calcareous plates. Crinoids of today tend toward deeper waters. The stalked varieties are usually found in water over 200 meters deep, though some can be found 100 meters deep. The unstalked varieties, comatulids also live in deeper waters though generally not as deep as the sea lilies. A reef knoll of which there are seven examples between Twiston and Clitheroe is a large pile of calcareous material on land that accumulated on the ancient sea floor, and was subse-quently uplifted due to the movement of the earth’s techtonic plates. At the time of this accumulation it may have had enough structure from organisms such as sponges to have been free-standing and to withstand the sea currents as material accumalted, and was probably an atoll. Another possibility is they are the remains of deep water coral. Such structures are thus often fossil rich. These structures are often most clearly seen where the surrounding rocks are much softer and so can be eroded leaving the charcteristic knoll shaped hill features; Examples in the Yorkshire Dales lie on the north-side of the Mid Craven Fault. There is one set located around Thorpe (Skelterton, Butter Haw, Stebden, Elbolton, Thorpe Kail, Myra Bank and Hartlington Kail); another set is located around Malham (Burns Hill, Cawden, and Wedber); and also a set around Settle (High Hill and Scaleber). Limestone Reef Knoll near Downham in Lancashire. The ‘Reef Knolls’ between Twiston and Clitheroe date from the Lower Carboniferous Period (358-323 Million Years ago) and have been subjected to numerous studies (the Carboniferous was the fifth period of the Palaeozoic Era). They were first described by Tiddeman (1889) who applied the term “reefs”. Subsequent workers (Parkinson 1926; Black 1952-54; Bathhurst 1959) all subscribed to the same name. They all believed that the knolls were composed of bio-organic material formed on a sinking sea floor with beds on all sides of the knolls showing an original dip away from the central core. In 1961 during the re-survey Earp raised objections to this hypothesis because of the apparent lack of reef-building faunas such as corals etc. to form the required wave-resistant structures and conglomerates, which should be present around such large knolls. 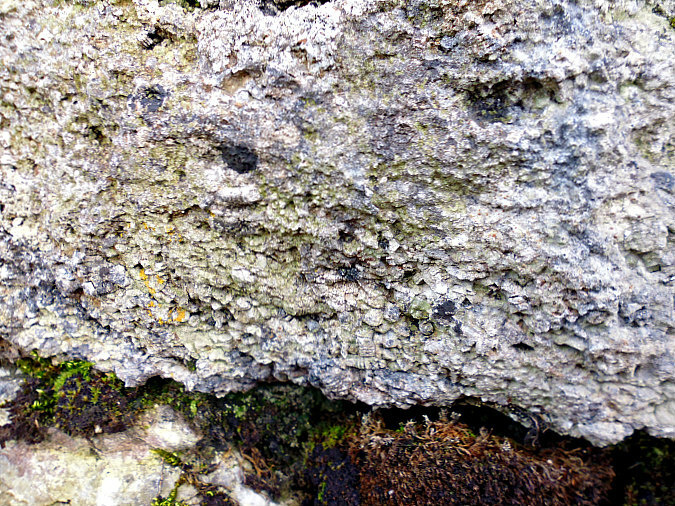 Rock with Crinoid Fossils at Twiston, Lancashire. Then in 1972 the story of the Clitheroe Reefs would take a step forward with the work of Miller & Grayson following another re-survey of the linear knolls, which run from Twiston to Clitheroe (including Sykes, Gerna, Worsaw Hill the highest at 300 feet, Crow Hill at 100 feet high, Bellman/Salt Hill the longest at about 1 mile, and Castle Hill). They proposed that the knolls were formed as water lime-banks essentially mud banks upon which crinoids would have thrived their dead deposits accumulating over time, and then as the deposits were uplifted the surrounding shale (solidified mud) eroding to leave the ‘Reef’ Knolls as low hills in the landscape. Over the years they have been called many things: Reef Knolls, Bioherms, Knoll Reefs and Coral Reef Knolls. Following the re-survey however, the Clitheroe reefs are now termed ‘Waulsortian Mudmounds’ – as they were first described in a Belgian Geological Survey. The Worsaw Hill reef knoll at Downham (OS grid ref: SD 7792 4322) has a Bronze-Age burial mound on its south-side and a cave near its base at the north-west side. And Worsaw End Farm was the setting for the 1961 film ‘Whistle Down The Wind’. 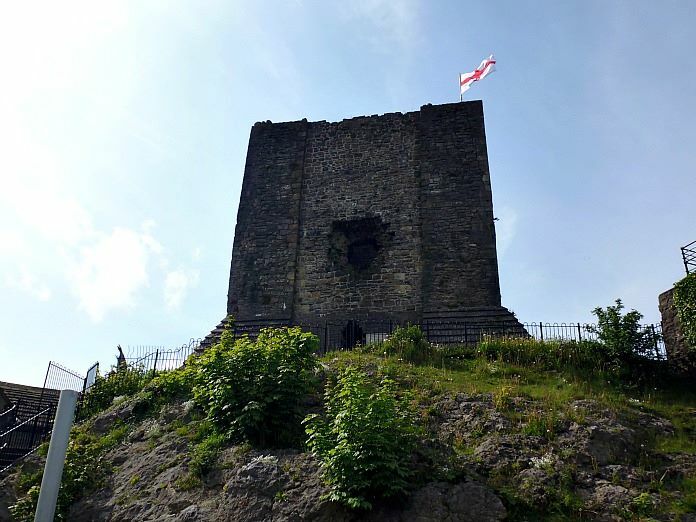 The focal point of Castle Hill, Clitheroe, is now the ancient Norman Keep. It is one of the smallest in England and one of the first stone buildings in Lancashire following the end of Roman Occupation. It was built by Roger de Poitou, who was the first Norman Lord of Clitheroe. The mound is comprised of light grey, unbedded micritic limestone, heavily jointed and calcite veined. 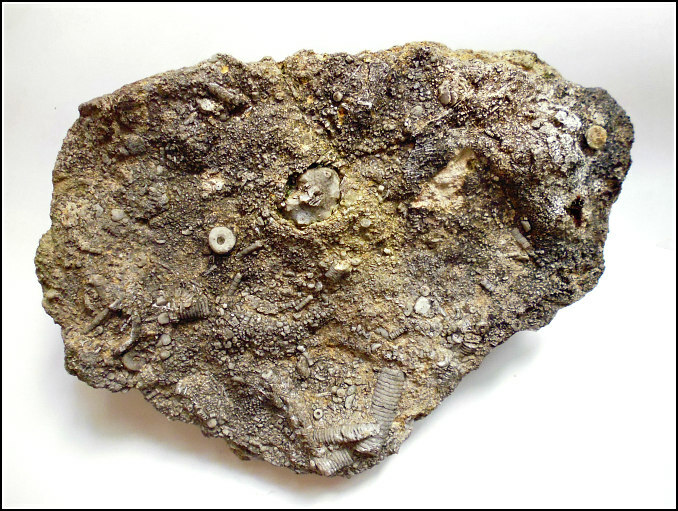 Crinoid fossils together with gastropods and brachiopods can be seen. In the castle grounds is the Clitheroe Castle Museum and café. Over time the ‘Reefs’ and surrounding deposits have been quarried for stone – as at Salt Hill and Lane End. Such stone was then used for the walls which surround the fields in the area ‘in question’ between Twiston and Clitheroe. Chinery, Michael., A Pictorial Dictionary Of The Animal World, Sampson Low, Marston & Co. Ltd., London, 1966. Roberts, John L., A Photographic Guide to Minerals, Rocks And Fossils, New Holland (Publishers) Ltd., London, 1998. ‘The Clitheroe Reef Belt’, Craven and Pendle Geological Society, 2006. Categories: Misc Subjects | Tags: Fossil Valley at Twiston near Downham in Lancashire | Permalink.